Another washi tape card!! I sure am loving this design!! I needed a card for a baptism today so I made up with baby one!! I added green and blue distress ink my DIY foam stamp and stamped it onto my white cardstock which I had spritzed with a bit of water. Quick and easy background!! I added three strips of washi tape - the one on the left is commercial and the other two are handmade using coloured tissue/gift wrap and double sided tape. 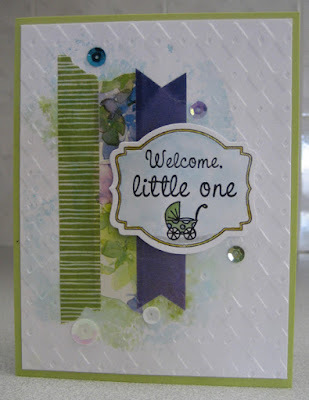 I put the background in an embossing folder and manually embossed the edges using a hammer. I watercoloured the laser printed die cut greeting (image font and regular font) and mounted it over the background using 3D foam tape. I added sequins using double sided tape - five this time instead of the usual three. I mounted this large element to a green card front. The congregation and the extended family were all invited to a potluck meal after mass and it was a wonderful time for everyone! !